These research sites for student papers and reports offer kid-friendly search engines, examples, formats, and guidance to ease the writing process. They provide primary sources, tips on structuring the report, and ideas for choosing a topic. Most of them are designed especially for kids and teenagers, and my students have found them tremendously useful. There is more to a kid's research project than looking up the biography of George Washington on Google or Wikipedia. Don't get me wrong. I don't know if I could survive without Google. And Wikipedia can be helpful for a general overview of a topic. But it is still hit-and-miss to find quality research resources on Google, especially for younger students with a limited vocabulary. (How many research articles have you "translated" for your elementary-age child?) And teachers do not consider Wikipedia to be an authoritative source, because most entries can be added or changed by anyone. The search engines and research tools described below are ones I've used as a teacher and parent with my kids, in the classroom and at home. And parents, this is definitely for you too. Of course... you know your child's term paper or research paper is YOUR research project too! Writing a research report is a step-by-step process. And the folks at Kentucky Virtual Library (KYVL) help kids to navigate it with their How to Do Research interactive. It's is a great tool for parents, students and teachers of grades K-8 (and some high school students too). KYVL takes you through planning, searching for information, techniques for taking notes, sifting through the information, selecting the format for, and creating the report. Although the online research is centered on Kentucky Virtual Library resources, this entire process is easily adapted to the use of resources in any school, city or state. Write Sources does an outstanding job of providing models and samples for all kinds of writing, and for research writing from grades 1-12. 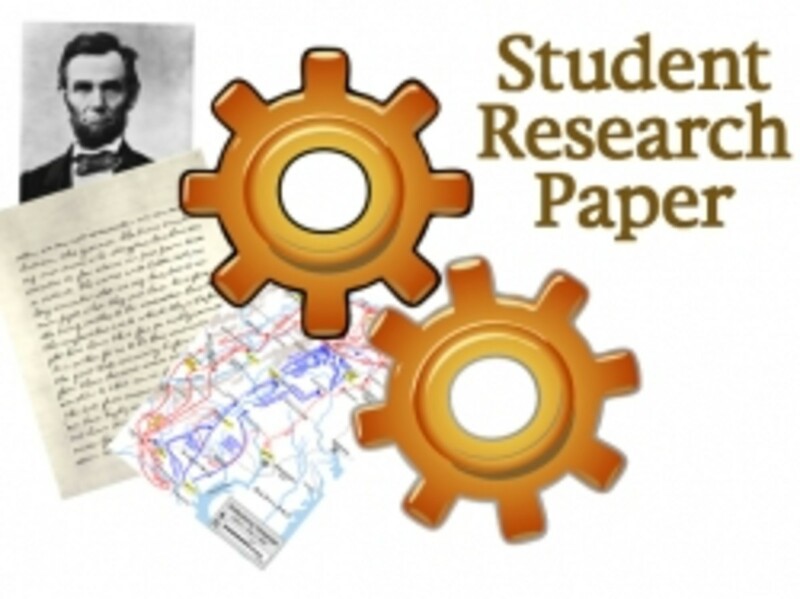 Step-by-step activity guide to writing a research paper for grades 3-5. Includes accompanying lesson plans for teachers. Guide for parents of students in grades 6-8 on planning and writing a research report. Activity with research starter questions and research info for several social studies, biography, and science topics. Self-paced learning modules helpful to high school, grades 9-12, and college students. Excellent guidance on searching for and evaluating information for use in research papers. Have you had this experience? Your 4th grader has to write a paper on what the different branches of government do. You find lots of information online, but you have to translate it for your child because she doesn't understand what she's reading. KidsClick! can be a big help. Think of it as the children's and teen's sections of your public library. Librarians have put together research sources that are kid-friendly. The search results include the reading level so your child can select ones he/she can more easily read. You'll also see that the KidsClick! main page has subjects arranged as they would be in a library. At the bottom of the page, you'll find a link to see the page as it would look through a librarian's eyes. All of the subjects and sub-headings turn into the Dewey Decimal number system as you would see it on the library shelves. My students had an "Aha!" moment when all those numbers finally made sense. Awesome Library is another student-friendly search engine. 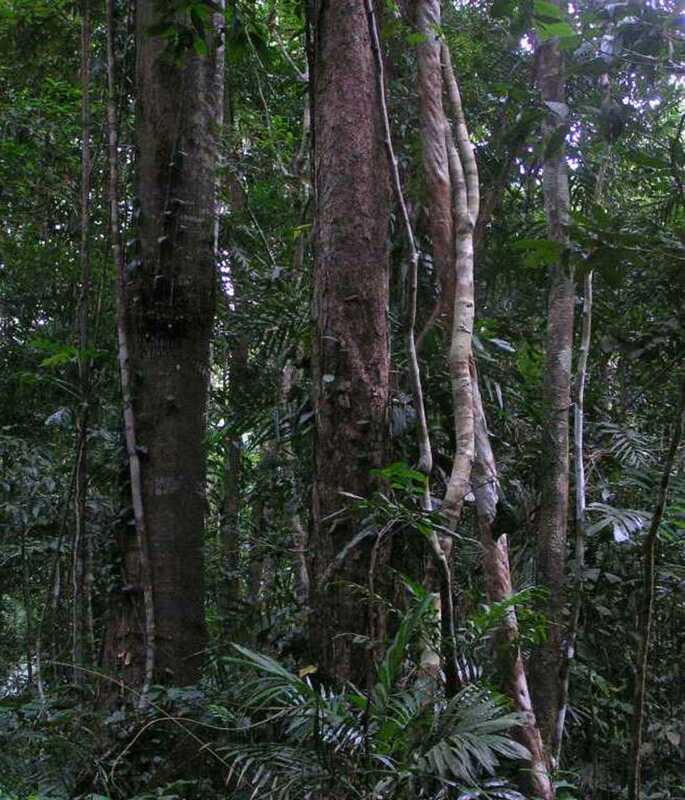 As the name implies, this site is also maintained by librarians. This award-winning search engine advertises that they have more than 35,000 resources available, the top five percent in education. In addition to the search feature, there are dozens of categories to browse through for kids, teens, parents, teachers, librarians and college students. Fact Monster, from Pearson Education's Information Please, is an award-winning often-reviewed site for kids. It offers some good tools for doing research on a variety of topics. These tools include an encyclopedia, dictionary, thesaurus and almanac. You can find info on the world, the U.S., people, science, math and money. Fact Monster's resources include a Homework Center with more excellent info and study guides. Fact Monster has some other excellent research paper tools. The Citing Fact Monster page provides helpful guidance about citing resources from their website. Another helpful page is their Plagiarism page. It explains what can be considered plagiarism, with examples, and what is considered common knowledge. The page also has links to their Homework Center pages on writing papers, footnotes and endnotes, and writing a bibliography. Love that! Internet Public LIbrary 2 is a merger of the Internet Public Library and the Librarians' Internet Index. In addition to its extensive authoritative search engine database, it has links on online newspapers and magazines around the world. If you need assistance with your papers, ask the IPL2 librarian, or browse through their frequently asked questions. IPL2 has separate sections for kids and teens. The Kids Section has resources targeted to students in grade 3-8 . The Teens Section has an A+ Research & Writing Guide with step-by-step instructions to help high school and college students put a paper together. Wow! If you're doing research for a paper on some aspect of American history or government, PLEASE look at the Library of Congress website. For social studies research, it's hard to beat the sheer volume of sources available on the LOC. They have more than 138 million artifacts, people! LOC's information includes digital documents, photographs and webcasts, many of them primary sources. Much of this material can be reproduced for educational purposes, but be sure to read the Rights and Restrictions Information. The reading level of the material is suitable for kids in grades 6-12, but younger students can make use of the archived photos and documents. They came in very handy for my fifth-grade daughter's presentation on Susan B. Anthony and the women's suffrage movement. 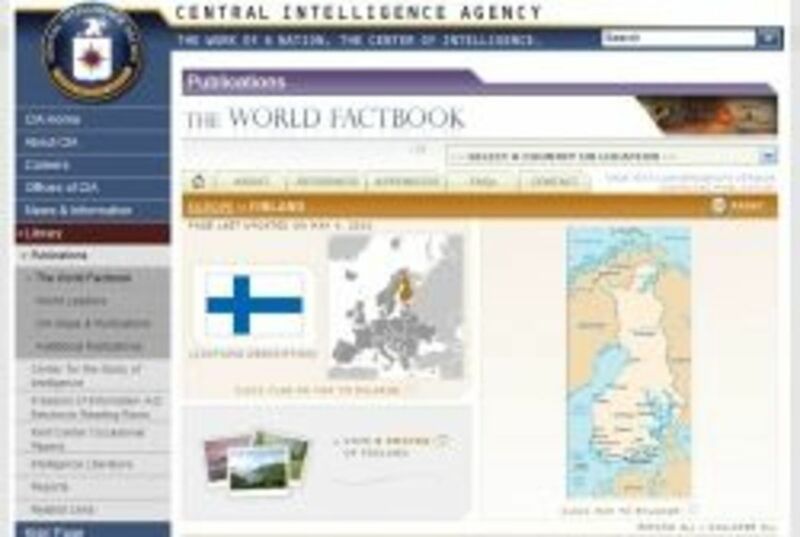 If what you need is fast, accurate facts about a country, take a look at the CIA World Factbook. Here you'll find brief facts about all of the countries of the world. The information provided is at the country level only. There is no information at the state or provincial level of a country. Now for the facts, which the CIA updates frequently: each country's flag and map; an introduction which may include a brief history; geographic features, climate and resources; demographic information about the population and ethnic groups; government and political structure; and details on the economy, communication, transportation and military; along with any transnational issues. And they fit all of that on one web page per country -- amazing! Another site I have frequently used for research with my elementary age students is MrDonn.org. If your 3rd grader needs to write about the customs, food and culture of Iroquois Indians, for example, this is THE place to find it! Mr. Donn has information on most social studies topics in grades K-8 and the site has won numerous awards. While the site lacks a search tool, information is easy to access using the major subject headings. There's also a section on Language Arts with guidance for writing reports and essays. We make frequent use of the thesaurus, dictionary and rhyming dictionary at Word Central. This Merriam-Webster site is designed specifically for the K-12 crowd. The dictionary has a speaker icon that lets you hear the word pronounced correctly. All of the components give you links to the other ones when you look up a word so your kid has plenty of options to find the right word for his paper. By the way, I love that rhyming dictionary. Kids writing poetry or songs will love it too! There are also lots of word games on the site. Another dictionary we frequently use is OneLook. Nothing fancy, just a great workhorse of a dictionary with synonym help. You plug in the word. 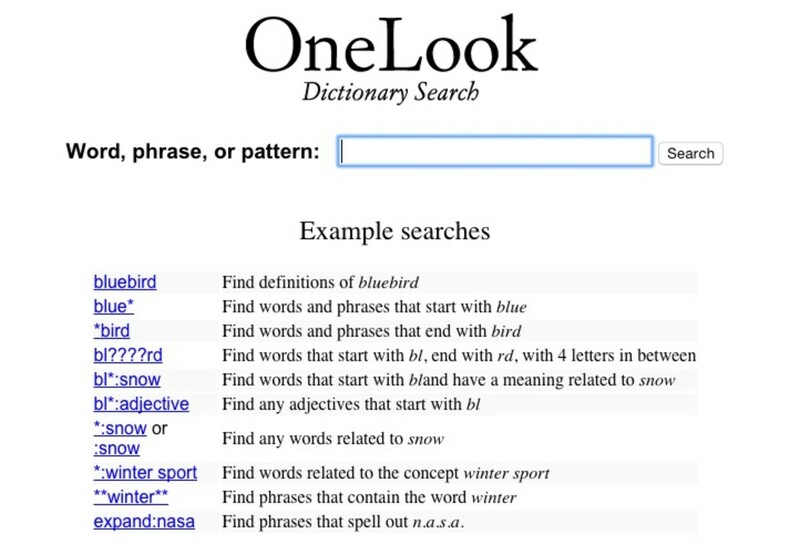 OneLook displays quick definitions, as well as the results of dozens of online dictionaries. A nice feature is the reverse dictionary. You type a short definition, such as "barrel maker". The reverse dictionary search returns possible words to fit the definition, ranked in order of the closest match. So kids can use the reverse dictionary as a kind of thesaurus as well. OK, let's admit it. The bibliography is the ugly underbelly of research writing. It's grunt work. But there's a simple online tool for making this task easier. 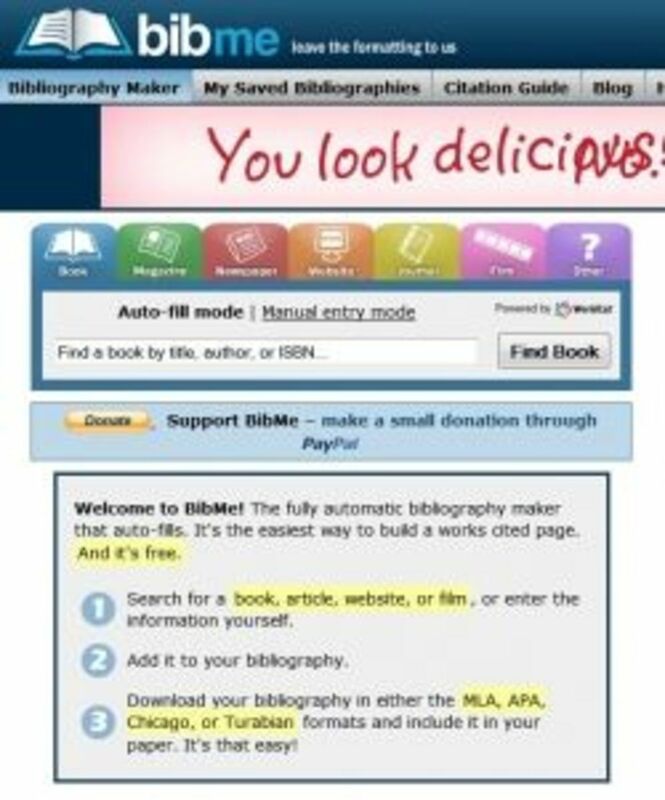 BibMe is an automated bibliography generator. There are options for several formats, including Modern Language Association (MLA), which is the type of citation commonly used in K-12 term papers and research papers. You pick the type of source (book, magazine, website, journal, newspaper, film, etc.). Use the auto-fill mode and conduct a search on your source. Once selected, the entries will be automatically filled in for you. Or select manual entry mode and a form asks for the vital information. You submit it, and voila! You copy and paste or download the citation into your bibliography. Or use the option to download and save your bibliography. Those options require free registration. If your child or student needs more help with research, check out more free resources listed on LearningReviews Guide to Research Skills Websites. What online research tools are most useful to your kids? Thanks for providing another excellent citation generator. This site offers lots of different citation formats. Bibme bibliography generator just covers some style of citation. This generator does not have CSE (Council of Science Editors) format. CSE is the necessary style in education most of the students used CSE style. So I found this generator http://www.researchomatic.com/cbe-citation-generat... they have 100's of citation style and it's very easy to use. What a fantastic resource for anyone! Not just kids. While searching for such tools and websites I came across this website it helps one to start on their research process. It features papers and presentations shared by their users. And the best thing is that they also allow users to ask questions that other users answer . Now that's something that would surely help me get on with my research. What an awesome lens! 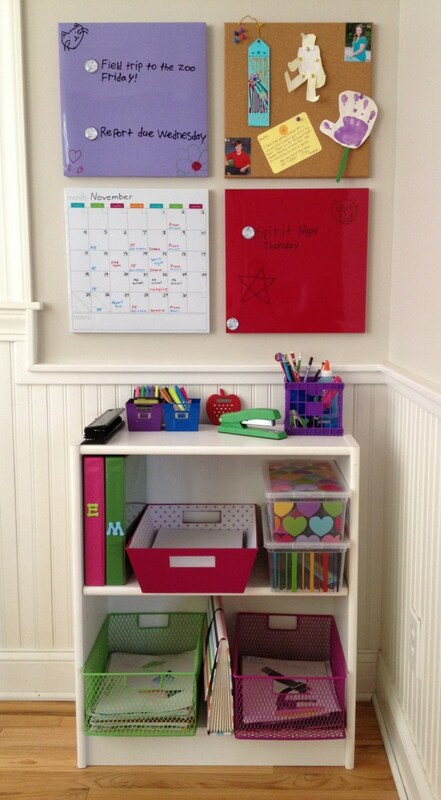 I can definitely use this resource list since I have a child in 6th, 8th, and 11th grade. Wow! They're going to love this! Thank you so much! The CIA World Factbook is great. I know a lot of kids now use Wikipedia, even though they should really be looking at all the footnotes for references. Great list. KidzSearch.com is a good one too. My kids are all grown, but I do use the CIA World Factbook quite a lot myself. Glad to see it included here! 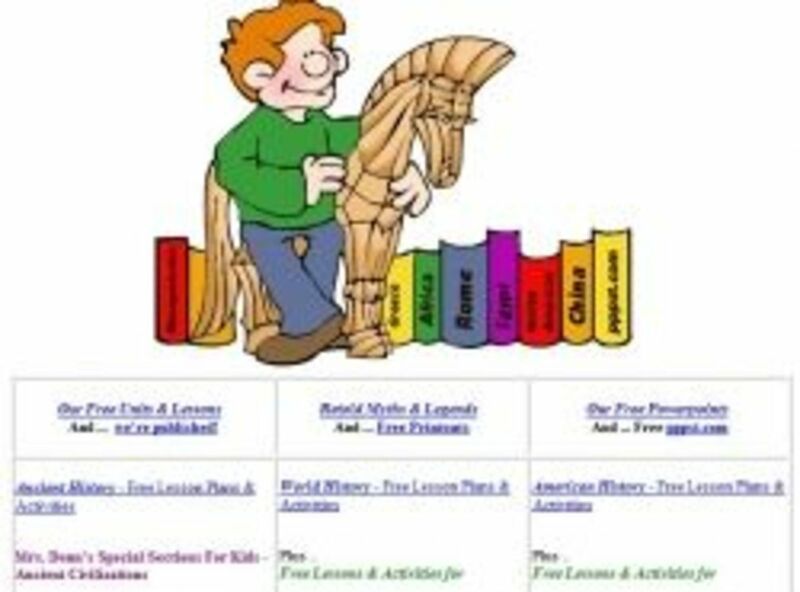 Another excellent resource you are sharing for kid safe and friendly search engine and again, so invitingly well done. really great compilation of websites. Btw, great looking lens. Awesome job! This information is perfect for my nephew who is doing a ton of studying right now. I had no idea these sites even existed. I don't have kids, but I think this is a great idea and resource for parents who want to their children to surf the web safely. The internet is flooded with all sorts of information and a lot of filth, so it's important to ensure that kids go to websites that are safe...well done! This is a very good resource. We often use the CIA fact book when we want to know about a country we are going to work in. I have to check out the others you have listed here. Thank you. 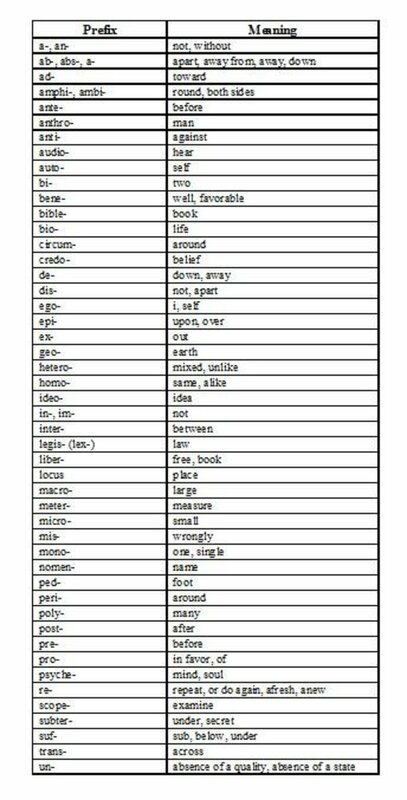 I would have LOVED using a bibliography tool like the one above - back in the day. Great lens, very helpful. Wow, what a great resource. Sure beats the days when we had to spend all of our time at the library. I'm in highschool and actually considering using a few of these! @anonymous: An abstract is a summary of the research paper. Summarizing is a skill 4th graders are just beginning to learn. Writing Fun by Jenny Eather has some good examples of writing at different grade levels. The summary is the last paragraph of each example. 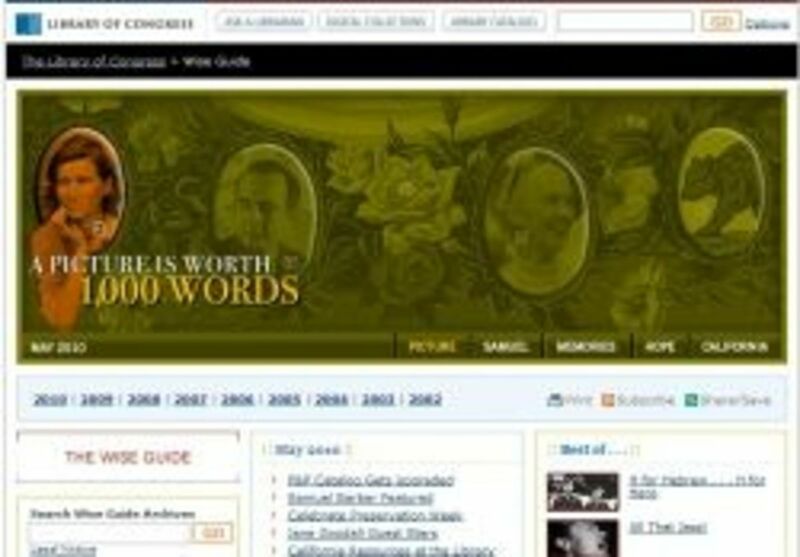 Here is the link to her site: http://www.writingfun.com/writingfun2010.html. The examples numbers are circled at the bottom of the page. I am looking for sample research paper abstracts that a 4th grader would understand. Something guide to better demonstrate what an abstract is. Here's another online resource for you, and btw it's also one that could help kids to develop a good reading habit. It's called infloox (http://www.infloox.com) and you can use it to research the influential links between people and books, or simply just generate a compatible reading list for yourself after inputting your own favourite authors/books. The MLA Citation Generator is very bare bones. You'll see a small box with an arrow at the top of the page. Click on the arrow to select the type of source - book, magazine, website, etc. 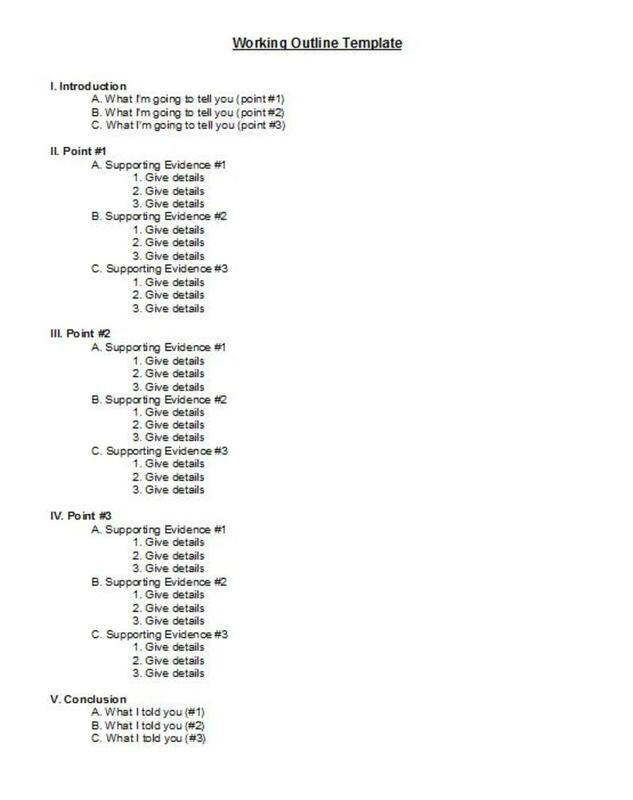 Then you fill in the blanks for the requested information and submit. 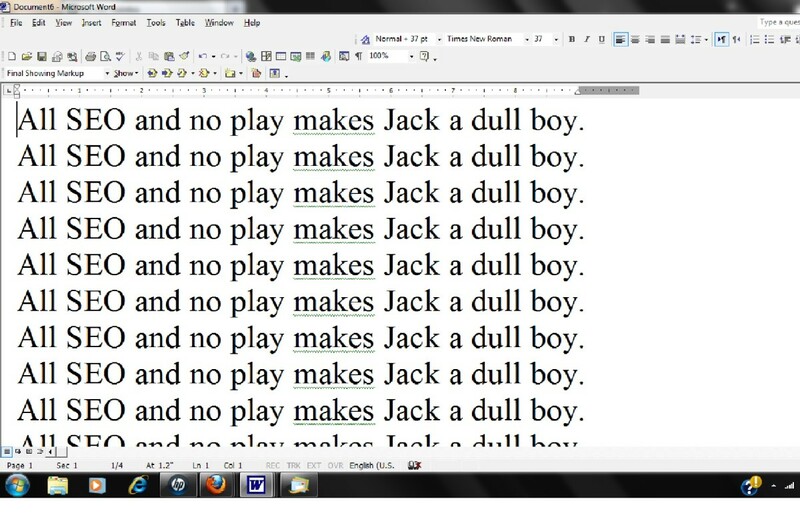 It comes back with a properly formatted citation that you can copy and paste into your bibliography. Another easy-to-use citation generator is BibMe (#6 on the second list). It provides more information, more formatting options and more options for saving your bibliography. You must register for free to use it. Has anyone found any other good citation generators? You have some very helpful sites here. I can't wait to tell my 6th grader about this. She has a report due in a couple of weeks and I thought I was going to have to do all the translating for her. You give me hope that she will be able to do her own research. Thank you.